Illustration courtesy of Orion Telescope. Orion's 9x50mm right angle, correct-image finder is available with black (#07212) or bronze (#07219) finishes. Either way, you get a correctly oriented image in your finder via an Amici prism, which I regard as crucial. The star patterns seen through the finder scope are the same as seen through binoculars or with your naked eyes. Because these finders have a 90-degree eyepiece, they are much more comfortable to look through than straight through finder scopes. You won't have to crawl around on the ground like a contortionist to aim your telescope when it is pointed up. Crosshair finder makes aiming your telescope easy by showing an upright, non-reversed image. Right angle design lets you view in comfort. No more crouching or craning your neck. Fully coated, achromatic glass optics yield crisp, bright images. I found both the stated features and specifications to be correct. For example, the actual weight of the tested finder, with bracket and lens caps in place, measured 17.1-ounces on my digital scale. The finder's optical tube features internal anti-reflection baffling. Focusing is achieved by turning the objective bell and is secured by a lock ring. The bracket's Vixen type mounting dovetail matches the Vixen shoe provided on most Orion, Celestron, Skywatcher, Meade, Vixen and many other telescopes. For example, it was a perfect fit in the integral Vixen accessory shoe provided on the rear cell of a Celestron XLT 102ED refractor. For telescopes without Vixen type shoes, Orion offers a couple of accessory shoes that accept this finder's foot. One of these shoes is available with pre-drilled holes to match Celestron, Meade and Orion SCT rear cells (no alteration required) and the other comes with holes spaced for attachment to scope rings of the type commonly used on refractor and Newtonian telescopes. I installed one Orion shoe on the rear tube ring of a Stellarvue SV115T refractor using the ring's pre-drilled and threaded (6mm) mounting holes and another Orion shoe on the rear cell of a Celestron C8 SCT, using that scope's pre-drilled and threaded accessory holes. The Orion shoes mated correctly with their respective telescopes. Rotating the finder scope in its bracket changes its alignment. Orient the finder scope to a comfortable viewing position before you align it with the host telescope. Once aligned, and the spring loaded Orion bracket makes alignment easy, the bracket's Vixen foot allows it to be quickly detached and reattached to the telescope with little alignment change. The image quality seen through this 9x50mm finder scope is generally good. Brightness, sharpness, contrast and color rendition are good across almost the entire field of view. Being an achromat, there is some visible color fringing, but what difference does it make in a finder scope? I found the view more than acceptable for both terrestrial and astronomical purposes. It is certainly far superior to the typical 6x30 finder that comes with most commercial telescopes; the Orion 9x50 is sharper and reveals dimmer stars and objects. It greatly simplifies aiming your telescope at faint objects in the night sky, particularly when used in conjunction with a red dot finder or laser pointer. I use all three finders--laser, red dot and optical--on my telescope for star hopping. The laser is fast and easy for finding your first guide star, the red dot allows more precise alignment and the 9x50 optical finder is the best of all for finding and aiming at small, dim objects. 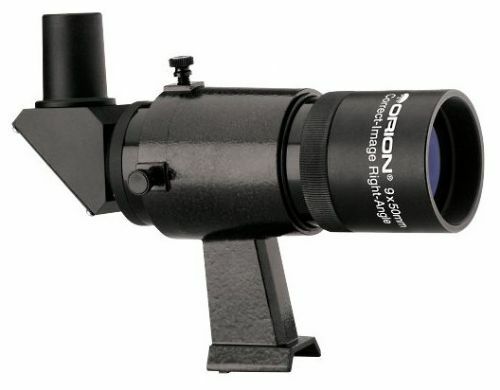 The bottom line is that this Orion 9x50 is a functional, versatile and economical correct-image finder scope. It is infinitely better than straight through, inverted image finders. Don't leave home without it.